No excuses on this one. 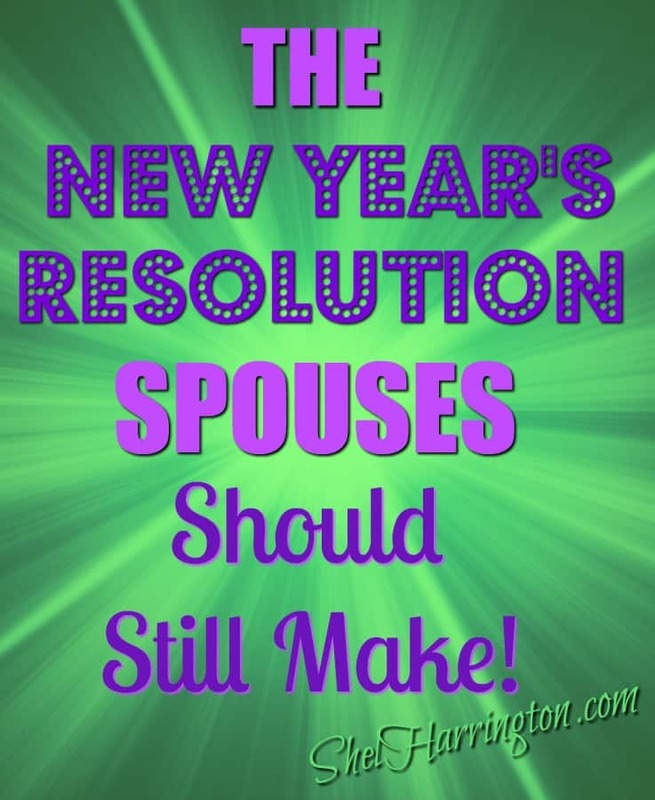 It’s not too late for you and your spouse to make a New Year’s Resolution. If your annual New Year’s Resolution is to not make one, make an exception this year. If you think you have already made enough/too many resolutions, I promise you there is room for this one, too – and it just may be the only one you actually keep! It is an amazingly simple concept that has been chatted about over the past few of years. You may have heard it referred to as “The Jar.” But it could just as correctly be called The Can, The Box, or The Cool Pottery Bowl. My husband, Steve, and I gave it a try a couple of years ago, and enjoyed the result so much it has now be an annual tradition! Grab the container of your choice and set it in a place where you will both see it often. When something of note occurs – your spouse gets a raise, you accomplish a new goal, a dear friend shows up for a surprise visit – jot it down on a slip of paper with the date and drop it into the container. Celebrate at year end by grabbing your favorite festive beverage, and take turns pulling notes out of the container to read to each other. In other words, remind yourselves of the highlights of the past year and the meaningful moments you might have otherwise forgotten! As we sat down to read on New Year’s Eve, I knew I’d find notes summarizing the wonderful visit we had with my folks in Florida, the articles I’d published, the award my husband received, the visitors we’d enjoyed, as well as a few challenges we’d encountered. But I’d forgotten so much! Like the night we had friends over for cards and one silly joke had the four of us doubled over with laughter, eyes streaming (which, of course, had Steve and I laughing all over again!) And the special day we had spent with Steve’s mother – one where signs of her dementia were minimal. And the movie that sparked a conversation between us that we would not have otherwise had. I have to admit that Steve wasn’t as enthusiastic about the project as I was back in January of last year. But, he loves me – so he humors me on such things. However, after the enjoyable note-reading session that had us chuckling, quietly remembering, chatting about progress made and plans to come, I wouldn’t be surprised to see more of those notes with his handwriting on them as we celebrate our next New Year’s Eve! Keep the container in a place where it’s easy to get to and you both see it often. Out-of-sight really is out-of-mind in this case. 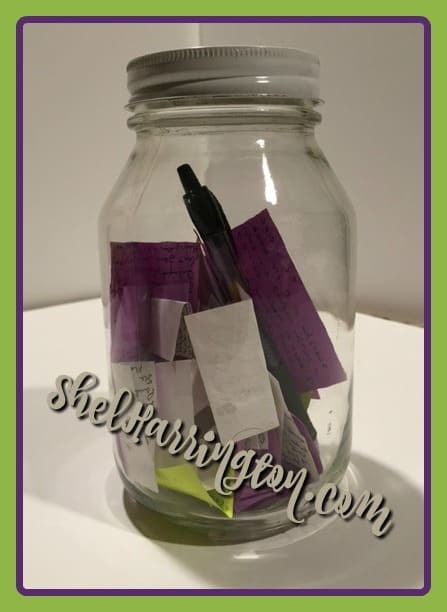 While any container will work, of course, I liked using the clear jar because existing notes served as reminders to write others and I could see the memories adding up. Avoid paper and pen hunts by keeping a pen and a mini notepad right in the container. An unexpected benefit of the project was the mindfulness we developed about looking out for special moments in our daily lives. 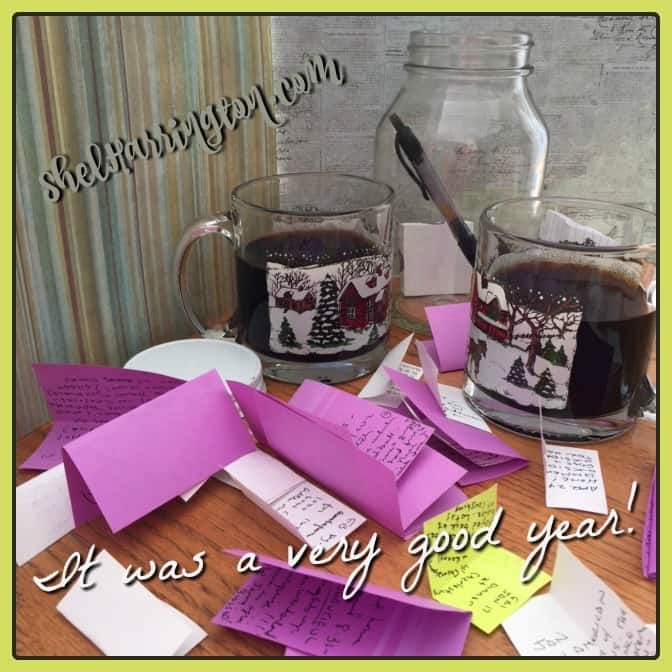 As the year moved on, we actually referred to having “a jar moment,” said “there’s one for the jar,” and had friends ask us if an outing we enjoyed together was “going to make the jar.” While it took only seconds at a time to do throughout the months, we ended our year with a lasting gratitude as we unfolded and read reminders of a year filled with blessings. What other New Year Resolution could you make that cost no money, takes almost no time, and has such an uplifting result?? I’m not normally one for these types of things, but I LOVE this idea. I’m going to start it tonight. Hubs will be game. He’s a great sport about things. Looking forward to trying it. Thank you! This is such a great idea, Shel! I’m sure this was a memorable New Years Eve. I’m LOVING those coffee mugs, they’re adorable! I think those mugs may have come from Arby’s back in the day when fast food chains lured us in with freebies instead of super-sizing! Totally love everything about this idea, Shel. One of our wedding gifts was a lovely pottery bowl with matching lid, and inside were instructions similar to these. On our first anniversary we were to read all the notes we’d put in during the year, and it was wonderful. We’ll have to start doing it again! I LOVE that, Marylin – and not just because I’m a pottery-loving-junkie! What a beautiful way to start off life and commemorate the years together! You’re welcome – and Happy New Year, Lin! What a great idea! Trying it. You’ll have fun with it, Lisa! And Happy New Year! We have done this for 3 years as a family. We call it the gratitude jar – and we read the collection of actions and moments shared over the past year at our Thanksgiving celebration. Love that, Maria – what a wonderful family tradition you have created! Happy New Year to you, too, Sherri! You are sooooo right – it’s never to late to start chalking up those jar-moments to be savored and appreciated all over again later. And truly, some of our moments need a little hindsight to really get the blessing of it. You have nicely summed up my feelings, too, with respect to our criss-crossing connections – whether intentional or inadvertant they always leave me smiling! Hi Shel, maybe you still remember me. Mirjam Penning. We met online quite a while ago. I have been ‘away’ for awhile, but picking up on things again in relation to blogging. Besides the point, only as an explanation. 🙂 I was checking my links approximately two weeks ago and saw yours. Got curious if you had continued blogging. Yes, you are! And I read this post. It inspired me as well. We now also have a look-through jar standing on our double computer desk, lol. Great idea. Love(d) it. It’s a regular vegetable jar and I cut out a red piece of thin carton paper. I wrote ‘Good Memory Jar’ on it and stuck it with transparent adhesive tape on the jar. Ready to use. We have one note in it so far, but I still like to add the memories from before you gave me the inspiration. Thanks for sharing this idea and posting the images of your jar. Hi, Mirjam – nice to hear from you! Glad your back blogging! I checked and I’m still connected to your site. I’m not sure if I had the second blog when we last “spoke” – if not, I’ll send you the link (it’s quite different from this one, more humorous). Delighted that you have your jar ready to go – hope you enjoy the results as much as I did (and hope to again this year!). Looking forward to continued connections – and Happy New Year! Yes, you then also had the second blog. It has been on my author link page since before my blogging gap. 🙂 Have paid a visit there as well. And I definitely see the humour there, lol. Looking forward to staying connected, Mirjam!